Although "school choice" supporters will still excitedly don their signature bright yellow scarves Wednesday, they will likely be fighting an uphill battle the rest of this session to get support in the Capitol. In the months after 2017's rally, House lawmakers unequivocally voted to reject school vouchers or similar programs that allow parents to use public money for private education. In 2018, a key election ousted some of the programs' largest supporters, including Rep. Ron Simmons, R-Carrollton, one of the loudest cheerleaders in the House. And as state Republicans tour the state making constituents a new set of education-related promises, many have swapped the words "school choice" for "school finance." So far, even Abbott and Patrick have rarely brought up their former pet issue without being asked — beyond Abbott's routine proclamation for this year's School Choice Week. New House Speaker Dennis Bonnen, an Angleton Republican, said last week that the House would not pass legislation approving vouchers — and that he had consistently voted no on similar bills. "I'm not willing to say, 'Hey, this issue is dead.' But leadership seems to be saying that, at least for this particular session," said Monty Exter, lobbyist for the Association of Texas Professional Educators, one of the biggest opponents of those programs. Randan Steinhauser, who along with her husband, Brendan, has helped lead the fight for voucher-like programs in Texas, said both Abbott and Patrick have been invited to support the cause from the stage at Wednesday's rally. But they aren't scheduled to give formal speeches. Sen. Ted Cruz and Land Commissioner George P. Bush, both Republicans, are expected to speak and, she said, "having one elected official after another is not the most engaging thing for our audience." "Thankfully, we will not be doing a huge lobby effort this session," Hock said. "What has become apparent to me is that the most important voice in this discussion is that of Texas families." "If that were the case, Dan Patrick would have lost. He's the biggest champion in the state, and he's coming back for another term," she said. "No one won or lost on the issue of school choice." Sen. Larry Taylor, the Friendswood Republican who chairs the Senate Education Committee, told a group of free-market conservatives earlier this month that school choice "is not going to be the focus this session" and "not part of the school finance bill." That's a far cry from 2017, when he authored the Senate's bill for private school tuition subsidies. But he's not alone in his change of tone. 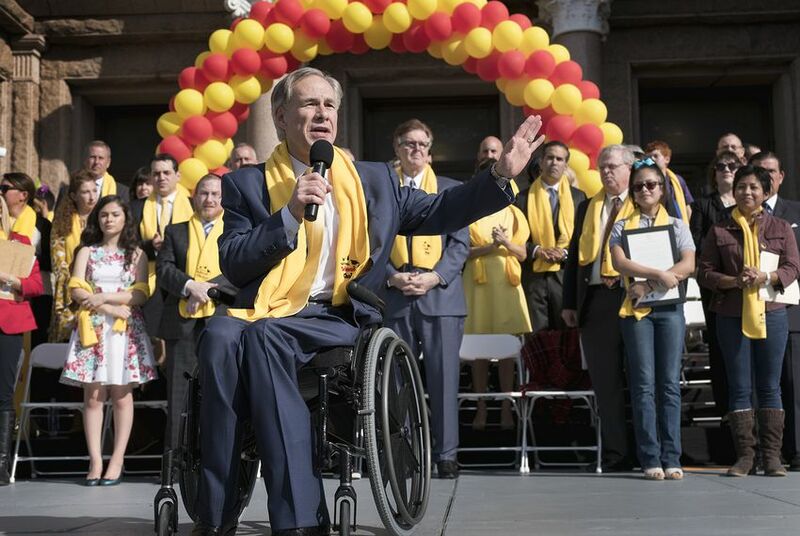 Two years ago, sporting a yellow scarf of his own atop a navy blue suit, Patrick expressed his disappointment with the Texas House in front of thousands of students and family members from charter schools and private schools. "We want a vote up or down in the Senate and in the House this session on school choice," he said amid loud cheers. "It's easy to kill a bill when no one gets to vote on it." This year, when asked whether the issue would return to the Senate, Patrick was less direct: "We'll see, we'll see. It's a long session." Disclosure: Stacy Hock and the Association of Texas Professional Educators have been financial supporters of The Texas Tribune, a nonprofit, nonpartisan news organization that is funded in part by donations from members, foundations and corporate sponsors. Financial supporters play no role in the Tribune's journalism. Find a complete list of them here.